Did you know that in spite of the facts, funds for arts education have been slashed? School funding for after-school programs of all types have been cut. 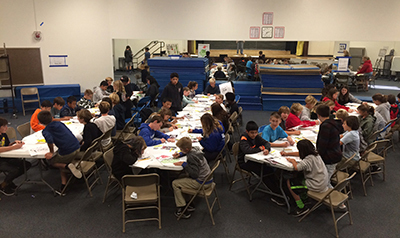 Currently, the Chuck Jones Center for Creativity provides our successful and transformative art-making programs to schools who have the funding, such as Huntington Beach, Irvine and Tustin. BUT we want to be able to offer our programs to all area schools, especially those serving low-income, at-risk youth, who have no funding for after school programs, such as Santa Ana, Costa Mesa, Garden Grove, Compton and many more. It is up to us to fill this crucial gap in arts education. And that is why we're writing to you today. We offer seven after school programs designed to nurture creativity in various forms of art-making for young students. Programs are one hour in length, for 6 to 8 weeks (determined by each school) and are offered fall through spring. Each program reaches 18-24 students. Our approach is process-driven …. the fun & discovery is in the hands-on activities, not the final product. These programs teach techniques that enhance each student’s ability to visually articulate personal expression. We provide a trained and qualified Teaching Artist, a Teaching Assistant and all materials for a one-hour program for 8 weeks for 18-24 students for the cost of $300. This is only $12.50 per student. Will you help make a difference? Please donate today. Yes! I wish to support Back to School Art Enrichment Programs by making a tax- deductible contribution to The Chuck Jones Center for Creativity. For a donation of $1,000 or more, you may designate a school or school district. Please contact Programs@ChuckJonesCenter to make those arrangements. The Chuck Jones Center for Creativity, a public charity founded in 1999 in Orange County California, fosters and teaches creative thinking, the thinking behind problem-solving. Creativity is like a muscle in your brain- it needs exercise to get and stay healthy. The Center serves as a “gymnasium for the brain”. Exercise your genius! Thank you for your generous support to the Chuck Jones Center for Creativity, a nonprofit public charity, tax ID #45-982522.